The National Broadband Network (NBN) isn’t far off completion, and when completed, fixed-line connections will cover 93% of households, with the remaining 7% to be put on a fixed wireless or satellite connection. The NBN has had a lot of hype, and the FTTP connection is what the NBN was designed to be – fast, reliable and easily expandable. So, what is FTTP internet and where does it sit among the wider NBN landscape? What is Fibre to the Premise? FTTP stands for Fibre to the Premises and provides fibre optic cable all the way up to your home, from the node and from the node to the point of interconnect (POI). These fibre optic cables are capable of gigabit speeds, but the top speed available on the NBN is 100Mbps. There are over 120 POIs across the country, commonly located where old ADSL exchanges are located. More information locations can be found here. FTTP was the original intention for the wider rollout, but cost analysis and a new government reduced the scope of the project to have FTTN (fibre to the node) be the most common connection type. This has resulted in FTTP connections being somewhat of a unicorn in the NBN landscape – existing only in a few areas in Australia, usually reserved for greenfield sites (i.e. unused land for planned estates). 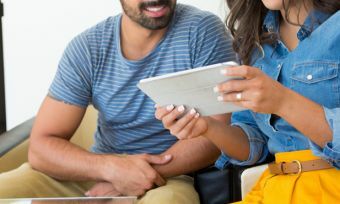 So if you’re one of the lucky few due to be connected, or if you’ve already got an FTTP connection, read on to find out what you can expect. How Much do Fibre to the Premises Plans Cost? Unlimited data can be found for as little as around $40 per month. Data-capped plans may be a little cheaper, but not markedly so. For this price, you’ll likely be getting basic NBN speeds. For something a bit faster, Standard Plus NBN 50 plans may offer more ‘bang for buck’ for the average household. Most providers offer plans at no additional charge on fibre to the node connections. Many providers’ plans are also available across FTTP, FTTN and FTTB connection types at no price discrepancy. All four speed tiers are usually available – up to 100Mbps. While the fibre on FTTP plans is capable of faster, that’s the fastest NBN Co – the company rolling out the national network – has set it to go. What do I need for FTTP NBN? 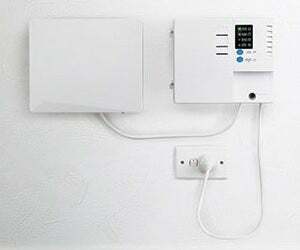 Fibre to the premises connections require an NBN access network device (pictured) that is to be installed in your home. If you aren’t yet connected, you may be required to pay $300 to set the connection up. This device requires professional installation and may come with battery backup, meaning you’ll still have access to internet in a blackout. One of the most important things you’ll need to consider for a fibre to the node NBN connection is if your router is NBN-ready. While this is important for other connection types as well, if you want to be getting the most out of your FTTP connection, having a modern NBN router capable of dual-band frequencies and AC speeds can transform your experience. Apart from your router, it should also be noted that in the date from when NBN arrives to your door, you have up to 18 months to switch over. Finding out what the speed tiers mean can help you find the right plan. This period gives you the time to think about your budget, the plan you want, and if you want to switch providers. Providers often provide a free transition from your old connection to your new one, but you can still switch providers freely if out of contract. How fast is Fibre to the Premises NBN? The fibre supporting FTTP connections is capable of gigabit speeds, but at the moment, the fastest speeds available to consumers are 100Mbps. For that you’ll need to hop onto a Tier 4 ‘Premium’ NBN plan. 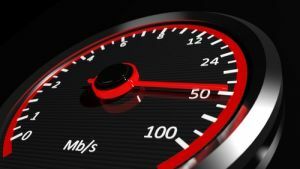 Unlimited data on this speed tier can be found for as little as around $85 per month, but many providers are over the $100 per month mark. As there is fibre all the way through the connection – from the POI to the node to the home – there isn’t as much reliance on proximity to the node as with other connections. This means you may be able to more reliably attain the top speed of your plan than other connections. With that said, retailers generally test your connection to see if it’s even capable of top speeds before putting you on a top speed plan. If your connection is not capable, the provider will likely offer you its next speed tier down. 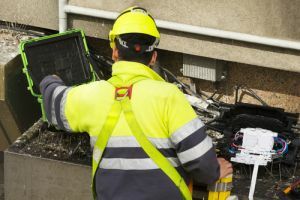 Like with other connections, FTTP is subject to peak time slowdown, often seeing a reduction in top speeds by 20% or more between the hours of 7pm and 11pm. This has given rise to providers advertising ‘typical evening speeds’. There are also a few other factors that determine your speed such as your router and its setup, installation quality, your actual provider, and more. FTTN – Fibre to the Node: The most common type of NBN connection. Fibre goes from a POI to the node, but traditional copper wiring is used from the node to the home. FTTB – Fibre to the Building: Common in apartment blocks, fibre is delivered from the POI to the building’s communications hub and the existing wiring is used from there. FTTC – Fibre to the Curb (Kerb): The newest connection type, FTTC uses a small distribution point near a property boundary (i.e. kerb), with copper used from there. HFC – Hybrid Fibre Coaxial: One of the more controversial connection types due to installation delays, HFC uses old Telstra or Optus cabling to the home. Fixed Wireless: Employs 4G mobile technology across 2,600 transmission towers that covers half a million residences. A roof antenna is used t connect to a base station, supplying 4G mobile data to the home. Speeds up to 50Mbps are available. SkyMuster Satellite: This consists of two satellites providing internet to remote locations such as Norfolk Island, Christmas Island and Lord Howe Island. A satellite dish must be installed on the home by a technician and the top speed available is generally 25Mbps. As you can see, a fibre to the premises connection is just one piece of the puzzle when it comes to the overall NBN landscape. FTTP is arguably the most desirable connection type, delivering fibre throughout the whole process. However, it’s also one of the rarest, so don’t get your hopes up about finding a FTTP-driven household if you’re on the move. Is my FTTP connection worth giving a hoot about? Ensure your router is relatively modern, capable of dual band frequency and supportive of AC speeds. If it’s more than a few years old it could probably do with an upgrade. Pick the right speed plan for you; top-speed plans may be disproportionately more expensive than the next speed tier down – NBN 50. You have up to 18 months to transition from your old connection to your new one so you have time to think about your options. All in all, an FTTP connection may be worth giving a hoot about as it’s likely one of the ‘best’ NBN outcomes you could hope for. With that said, if you’re already connected and unhappy, you could also look at the NBN alternatives as just because you have an NBN connection doesn’t mean that you need to maintain an active NBN plan! Overall, it can be confusing deciphering all the acronyms, and FTTP is just part of the puzzle of NBN. Shop around for providers to see what’s right for you.